It was never Liam Watson’s approach to look back in anger, either at Deepdale, where his career was cruelly cut short, or at the vagaries of football fortune. The most successful manager in Southport’s history always preferred a more pragmatic and measured approach to life. Still, his unexpected return to Southport for a third spell, replacing ex-North End striker Kevin Davies last summer, did provide his sternest examination. 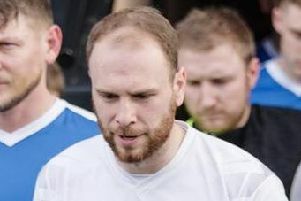 “I’ve managed for 20 years, but the first 12 weeks of this season proved to be the hardest,” said Watson ahead of today’s home date with National League North league leaders Chorley. Indeed, a humbling 4-0 defeat against the Magpies at Victory Park set the tone and by the end of October Southport were rock bottom. 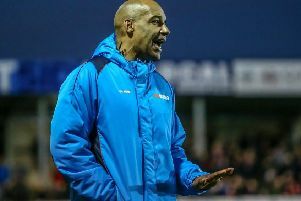 And Watson, the only Southport boss to win two championships, the Conference North in 2005 and 2010, was under growing scrutiny by the fans who had heralded his return. He added: “It was incredibly difficult, there was such a horrible, toxic, atmosphere in the dressing room. “There was no camaraderie, no steel or any desperation to win games. There was a desperation to look good, for sure, and to pretend that they were professional footballers. “I told them that they needed to be in the Football League to be professionals and they were nowhere near that. “Far too many of them, who just shouldn’t have been there, had an unbelievable opinion of themselves. Watson culled his top-heavy squad, and a dozen players were bundled through the exit door. A battling FA Cup draw at Tranmere Rovers sandwiched in between a 10-game unbeaten run helped to restore lost pride, providing a strong foundation stone for the remainder of the campaign. Southport, though, as Watson admits, has never been an easy club to manage. Just ask Mike Walsh, Paul Cook, Peter Davenport, Gary Brabin, Alan Wright, John Coleman, Martin Foyle, Brabin (again), Paul Carden, ex-PNE assistant Dino Maamria, Andy Bishop, Steve Burr, Alan Lewer and Kevin Davies. None of them lasted a full season in charge, as Southport lurched from one crisis to the next. “When you see that list and the hundreds of players used, that’s just a crazy figure,” said Watson. “The club was so set in its ways for so long, whoever came in had an almost impossible job. “Now Phil Hodgkinson and Ian Kyle (new owners) are beginning to re-engage with the community. Southport’s FA Cup second-round replay against Tranmere provided the first full house at Haig Avenue for many years. “I never ever thought that I’d see Haig Avenue full,” said Watson. “When we played Sheffield Wednesday in 2010 in the FA Cup we couldn’t do it. “But the Tranmere Rovers tie was sold out a week before and that was amazing to witness. Southport has traditionally not been good in terms of going out and getting new business. With Natalie Atkinson coming in as chief executive she has been a breath of fresh air. Watson saw for himself the damaging politics and power struggle which tore the club apart during a brief tenure as operations director in 2016/17. It ended in disappointing fashion, with his dismissal coming via e-mail as boardroom drama overshadowed the club. Watson’s football ideals are enshrined in vivid memories from John Beck’s Deepdale days. The former North End boss paid Warrington £25,000 for him, and Watson made a noteworthy start, scoring in a 5-2 victory over Rotherham. He then netted in each of his next two appearances against Port Vale and Huddersfield. Injury cut short his progress after that, but Beck was the catalyst for Watson’s career in management, which began with Runcorn in 2000 and saw him win silverware galore and crowned non-league manager of the year. “John Beck was a massive influence, the best manager I ever worked under,” says Watson. “He was miles ahead of his time and he was ridiculed – now he’d be classed as a wonder coach. “John got a lot of stick for using the long ball, but he was 10 years in front, with his ideas on diet and preparation.